Of course! Especially during winter, you can have a lot of fun experimenting with all kinds of ingredients. Although fresh fruit is not available at this time of the year, you can always use canned fruits alternatively or merely fruit juice to produce aromatic alcohol. If you prefer fresh ingredients instead or if you're just looking for new ideas, the below-mentioned alternatives will do the trick for you! First of all, you need to crush the grain which will afterwards be soaked in water. This mixture is brought to a boil (62°C) while enzymes (or malt) are added depending on the type of Whisky you wish to produce. Stirring everything for 30 min is very important in order to avoid scorching. The mixture is then heated up to 72°C for another 30 min (keep stirring). Please note that the temperature has to be constant during that process to ensure the full conversion of starches into sugar. 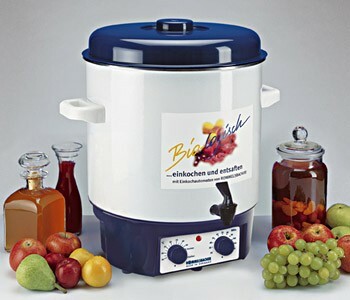 To guarantee success, we recommend our Rommelsbacher preserving cooker which allows a safe temperature control. After cooking the mixture, everything has to cool down to a temperature below 25°C so that the yeast can start fermenting at optimal conditions. After that, the mash is filtered, distilled and stored away in oak barrels for several years to receive the typical smoky Whisky flavors. Please do not add the yeast at high temperatures! The resistance to heat ends at 25°C for most yeast cultures and should not be exceeded! The best alcohol yield during fermentation can be expected at 24°C. The shortcut to producing Whisky is distilling beer! You don’t believe me? Well, then try it for yourself! After distillation is over, merely add some toasted wood chips (available in natural, medium and strong toasting) and store the mixture in a barrel for approx. one week. You will be amazed how little time and effort is needed to produce a good quality Whisky. Invite your family and friends to find out if they can taste the difference! Another possibility is to distil your own spirits. Whether you have opened bottles or other alcoholic leftovers that you would like to add some taste to, simply try to distill them by adding various spices to the liquid or place fruits on top of the integrated middle sieve in your still to begin transforming your beverage into your favorite drink. Distil your own Ouzo or Gin by adding anise or juniper berries. Or start experimenting by adding garlic, lavender, coffee powder or whatever you may find in your kitchen. Use your creativity to create your own unique beverages.